I know it might be dreary out today but the sunshine, flowers and living outside is coming back! Two weeks before Mother’s Day should be a beautiful Spring day and I just happen to be having a day of Family Mini Sessions! These will make a fantastic present for your Mom and she’ll have beautiful new family pictures to show off by Mother’s Day! Mini Sessions are just 20 minute photoshoots. These quick photoshoots are perfect for wiggly little ones or even surly teenagers that don’t really want to do a family photoshoot. We’ll have a few cute set ups, get a variety of combos with your family and of course one of just the parents. I mean, when was the last time you had a picture without the kids in it? The other great thing is that these are budget friendly! A full family portrait session can be in the thousands. These are just $250 and include 5 digital images. About a week after your shoot you’ll get an online gallery of edited images to choose your favorites! If you’d like to purchase professional prints or products you can do that as well! As a parent of a wiggly little toddler, I know how hard it is to get everyone ready, do the photoshoot and then pick your images. I try to make this process as seamless for you as possible. 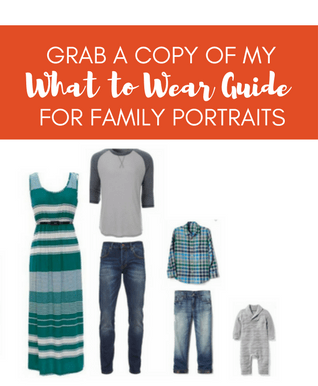 I’ll even send you my What To Wear Guide to help you coordinate the whole family! I know everyone in white or black shirts is easy, but it’s so dated. You’ll all look so great coordinated in colors, patterns and textures.